Funeral services are scheduled for 10:00 a.m. Wednesday, April 10th, at the Smith Funeral Home in Victor with Rev. John Epperson, Grinnell Regional Hospice Chaplain, officiating. Pallbearers will be Todd Rudin, Joel Grimm, Steve Mercer, Josh, Daniel and James Blount. Honorary bearers will be Steve Rudin, Stan Grimm, Tom Thys, Rob Nowotny and Brandon Rudin. A funeral lunch will follow the service at the Victor American Legion Hall. Burial with military honors will be held at 2:00 p.m. Wednesday at Oak Hill Cemetery in Williamsburg. 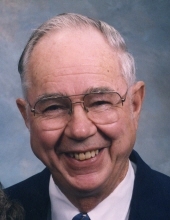 Visitation will be held from 2:00 p.m. to 7:00 p.m. Tuesday at the Smith Funeral Home with the family present from 4:00 p.m. to 7:00 p.m.
Eugene was born on October 26, 1925, in Williamsburg, the son of Alfred William and Grace Elizabeth Snyder Blount. He was raised and educated in Williamsburg. He was employed by Harris and Son Elevator Company in Williamsburg as a truck driver delivering feed and grain to various customers from March 1943 to March 1944. Eugene served in the United States Army from 1944 to 1946 with Company E 255th Infantry. During his military service in the European Theatre, he served as a First Scout and as a Platoon Runner, delivering messages. For his military service, Eugene was awarded a Purple Heart, a Bronze Star, a Good Conduct Medal, a European Ribbon, and various commemorative medals. On June 1, 1947, he was united in marriage with Dorothy Mae Cray, in Marshalltown. The couple lived in North English and Ladora before moving to Victor. He was employed at Amana Refrigeration as a paint foreman for 36 ½ years, retiring in 1987. Eugene enjoyed visiting with family and friends. He was quite a carpenter and enjoyed working with wood. He also enjoyed traveling and camping; and after his retirement he would spend his winters in Arizona with his friends there. Eugene had been a member of the Victor American Legion for over 20 years. He carried the flag during parades and participated in the Honor Guard. He was presented a special Certificate of Recognition by the Eastern Iowa Honor Flight (EIHF) for his support over the years. He was on the first Honor Flight and had attended every Honor Flight homecoming since then. He is survived by his children, LaRae (Steve) Rudin of North Liberty, Deborah (Stan) Grimm of Newton, Les (Karen) Blount of Cedar Falls, Chris (Kathi) Blount of Deltona, Florida and Robin Darling of Summers, Arkansas; 12 grandchildren; 20 great-grandchildren; and two sisters, Elaine (Larry) Means and Deloris Miller. He was preceded in death by his parents; his wife, Dorothy in 2007; three grandchildren, Linda, Robert and Ezra; two brothers, Edwin (Lucille) and Wayne (Rose) Blount; five sisters, Geneva (Hank) Simeons, Ruth (Gene) Ferrel, Dorothy (Don) Hite, Maxine (George) Gegenheimer, and Marguerite (Floyd) Kahler; and a brother-in-law, Doyle Miller. To send flowers or a remembrance gift to the family of Eugene William Alfred Blount, please visit our Tribute Store. "Email Address" would like to share the life celebration of Eugene William Alfred Blount. Click on the "link" to go to share a favorite memory or leave a condolence message for the family.